Ella and Alice are trying to forge a path with the men they love in a world reeling from the Great War and the influenza pandemic that left the countryside crawling with the undead.Then Alice goes missing without a trace, until the new vermin queen sends an invitation--Ella is welcome to try and rescue her friend before Elizabeth lets her subjects tear the housemaid apart. 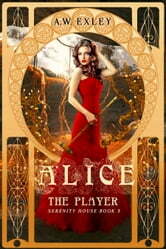 To save Alice, Ella must venture into a subterranean world ruled by her former step-mother. But does Elizabeth play to merely torment Ella, or is there a more sinister purpose? One tied to the endless wave of vermin spreading across Europe?Someone is going to lose this game and forfeit their head, but will it be Ella or Elizabeth? Elements of this novel are inspired by Alice in Wonderland, and it is a direct continuation of Ella's story.